Seattle Opera Blog: Photo-of-the-Day Caption Writing Contest! Yesterday's captions were QUALITY! We had a tough time choosing the winner as you all kept us thoroughly entertained! Yesterday's winning caption goes to Mike Bates for his thought, "For Heaven's sake, kid, I said bring me a BEER!" YOU tell us what's going on this picture! Leave your creative captions in the comments below (include your name if you want to win); winner announced tomorrow morning along with the new daily photo! "How does she sleep with your insipid screaming?" Wow. The Lunesta butterfly sure has a fierce new look. Okay, the tranquilizer spear works. Now how much will it cost to get you to wake her up? Lawn Darts, Version 1.0. A fun time for the whole family! Great, now you've really done it. I told you that Vulcan deathgrip was dangerous stuff. I'll never get Fricka to shut up. "I've heard of 'kissing cousins', but this is ridiculous!" I see you're busy ruining the elbow of someone else's sleeve already. Amazing! She can even sleep through 'Ho Jo To Ho'! 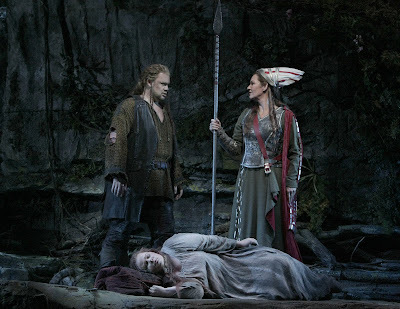 "Brunnhilde, I know I said my husband is a thorn in my side but this is ridiculous." How many times did I tell you not to run while carrying a spear? Even if you have a new tiara to show her, if she didn’t want you to wake her this month, there is no point. ....And look, not only is it RAZOR sharp, it also comes with this very attractive "reclining woman" speer stand for easy storage. No Siegmund, we're not going to play "rock paper scissors" for it--Dad said it was my turn to skewer the fair maiden! Well, you know the rules: first person to fall asleep at a slumber party gets their undies frozen. I dare you to poke her with your spear, in fact, I DOUBLE dare you!! OK, That's the last time I'm taking her to a toga party!